Shredder from Teenage Mutant Ninja Turtles. From the creative minds of Funko and Playmobil, comes a collaboration meant to be collected! From Teenage Mutant Ninja Turtles, this Shredder figure combines Funko's take on the classic character with Playmobil's iconic body design. The figure does not include any additional accessory pieces. 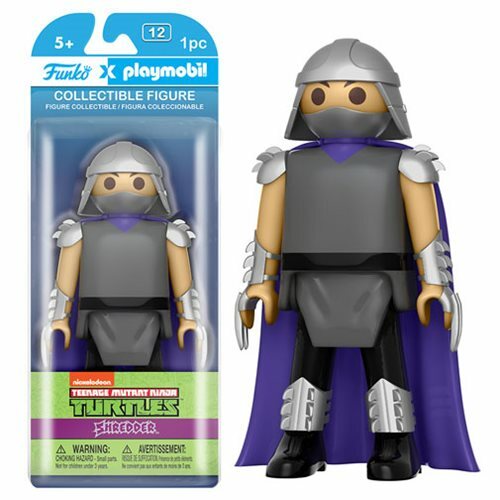 The Teenage Mutant Ninja Turtles Shredder 6-Inch Playmobil Action Figure is also scaled up from the traditional Playmobil size and measures approximately 6-inches tall, packaged in a blister card. Ages 5 and up. Funko's collaboration brings you Playmobil figures that are bigger than ever! They're twice the size of the classic Playmobil figures you've loved since 1974. Each figure features articulation at the shoulders and wrists.